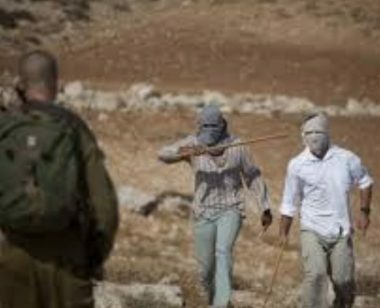 A group of extremist Israeli colonists attacked, Saturday, many Palestinian farmers on their own lands in Beit Ummar town, north of Hebron, in the southern part of the occupied West Bank. The WAFA Palestinian News Agency has reported that the assailants, including a security guard of Karmie Tzur illegal colony, which was built on private Palestinian lands, hurled stones at the farmers, while shouting and cussing at them. The attackers forced the Palestinians out of their lands, and threatened to kill them, while Israeli soldiers stood nearby without intervening. Among the Palestinians who were attacked by the colonists was Ibrahim Sabarna, and his family.